I've been run over by a reindeer! Does anyone else feel exhausted after the holidays? I feel like I have been run over by a reindeer! Christmas was wonderful at our house, I always love seeing the kids open their presents. This year the kids picked out presents for each other and their cousins. The girls were almost more excited to see how the cousins and their brother & sisters liked the presents they had picked for them. It's also really nice having the kids off school for two weeks and not having to rush off to school in the morning and worry about homework at night. Above is my exchange received from Maria (all the way from Spain). It was a Prairie Schooler exchange from the HOE blog, out of PS #163 "Signs of Spring", I love it cause I can leave it out on display for a few more months with my spring decor. She also painted the Beatrix Potter inspired goose. It is a watercolor, and just amazing. She is so talented, I am always in awe of people who can stitch AND draw AND paint AND any other creative talent that's out there! 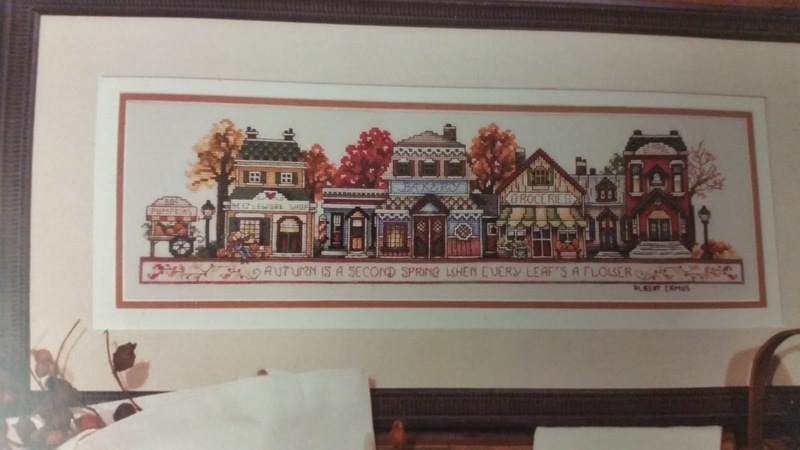 My exchange that I stitched hasn't arrived yet so I can't show it off. 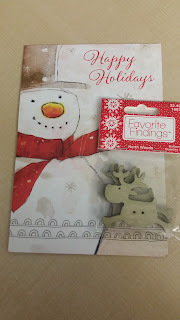 And last but not least a sweet little Christmas card (and super cute reindeer buttons) I received from Rachel of the Wandering Bunny blog. Rachel if your reading this I couldn't find a way to email you directly, but THANK YOU for being so thoughtful! Rachel was my exchange partner for the Halloween exchange on the HOE group. I thought it was so nice of her to send me such an adorable card, and I can't wait to find just the right project to use the reindeer buttons for. I hope everyone had a wonderful Holiday season, and is getting some much needed rest and relaxation afterwards! I'm on the naughty list?!? What do you mean i'm on the naughty list?!? We tried to get some pictures today for our holiday cards. While my girls were angels as usual, it's impossible to convince a toddler to just hold still and look at the camera. So we've scheduled a portrait studio appointment for Tuesday cause there is only so many animal noises I can make...i'm just going to have to leave our holiday photos to a professional. I do love his expression in the above photo though, doesn't it just perfectly capture the surprise of being on the naughty list! 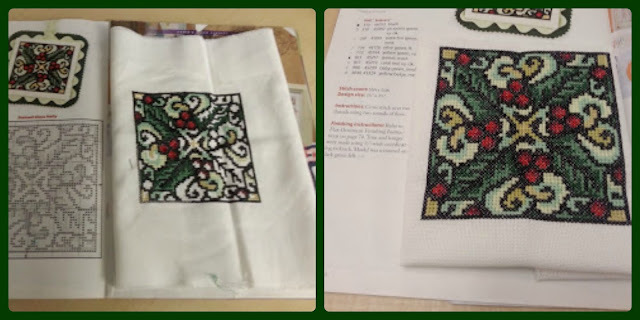 And here is what's in my stitching basket for this month. 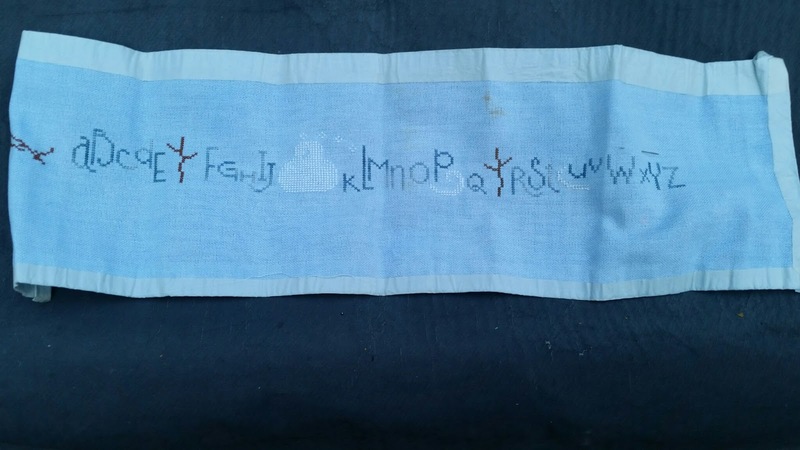 I am debating whether "Winter Row" can be saved, I hand dyed the linen, but had put it away for a few years and now it has a brown spot above the lettering. I tried spot-treating it but then that washed out some of the color of the linen. I almost want to just throw it out and start over. 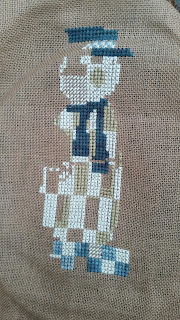 And this is a Trilogy design, just a simple checkered snowman, really not much left to finish him up. I am kind of winging this one, the letters are from Lizzie Kate's "Winter Alphabet", but I just wanted to make a small ornament of it. Not sure if I am loving it yet, but I may as well finish it now. And probably the closest one to being done, another Lizzie Kate. 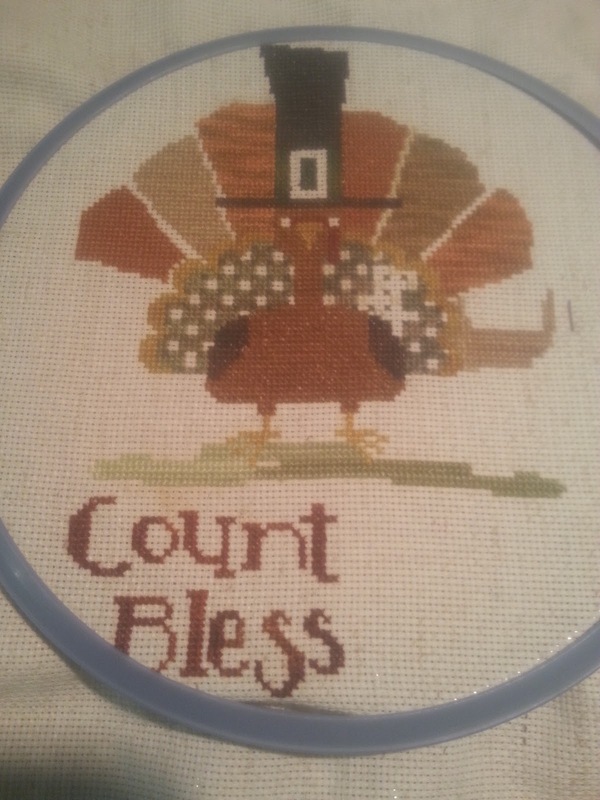 All I need to do on this one is add the buttons and stitch Mr. Cardinal's beak. Fingers crossed he finds his way onto my tree for this year and out of my WIP basket. In my ongoing effort to reduce the size of my WIP basket, I have started selecting a bunch of seasonal charts to try and finish each month. For November I did manage to finish Bent Creek's "Thankful Quaker", but put a pitiful number of stitches into "Uber Turkey". See the half finished feather on the right hand side? That was my progress, all of it. 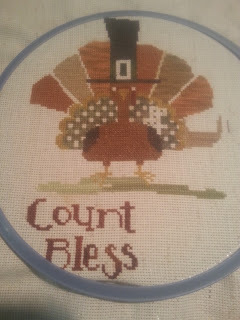 So Mr. Turkey will be put away for next November, and I am moving on to the "winter" section of my WIP basket. 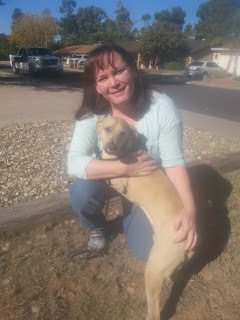 And this is the "done" part of my month, our foster dog Robin completed her convalescence in our home, and returned to the Humane Society to be adopted. 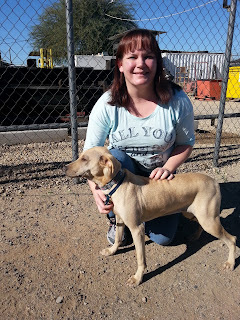 Actually her recovery was pretty easy on our part, she had lost her hair due to malnutrition so we just had to feed her and give her lots of love. She did have a beautiful blonde coat, and a funny smile whenever she was happy or excited (you can see it in the photo above). I think she set the record for least amount of time actually spent back at the shelter, she was adopted within two hours of us dropping her off! Most of our foster dogs that we have returned have been adopted within a few days. It still makes me a bit sad when we have to give them back, but knowing we saved a life and that they can now find forever homes helps. 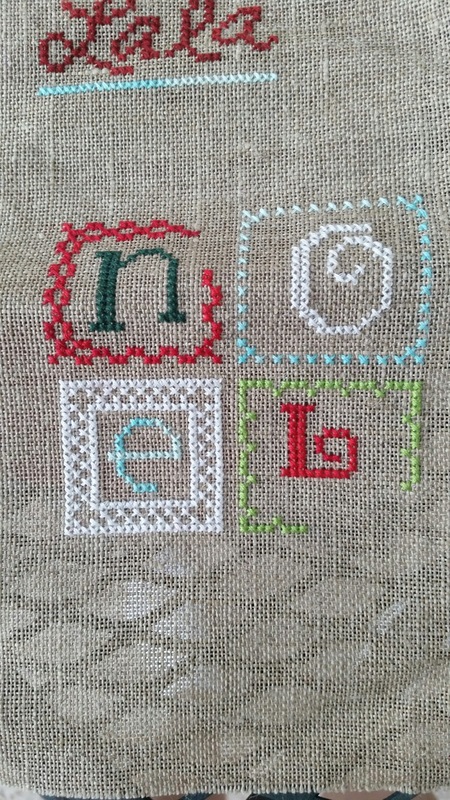 Trying to move some WIP's out of my stitching basket before the end of the year. 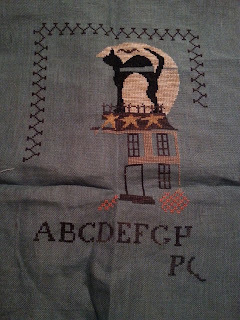 This one is now done, well not in the photo above yet, but I worked on it all last night and now just need to iron it. 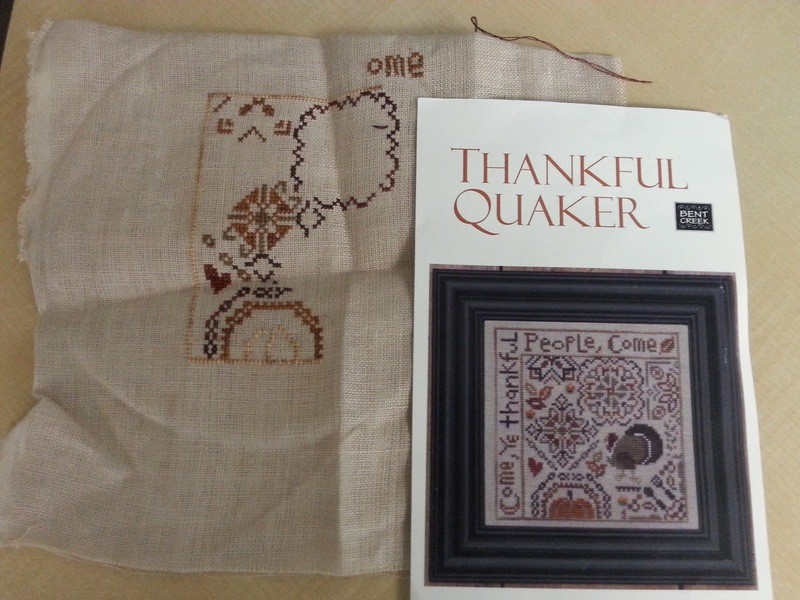 It is Bent Creek's Thankful Quaker. I loved all the shades of brown/gold in it, very seasonal colors. 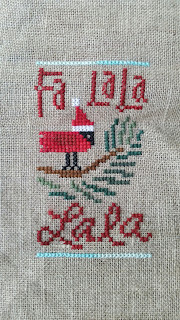 I have also been doing a bit of Christmas stitching. I keep a small lap sized quilt on my couch, and am working on having one for each month of the year. 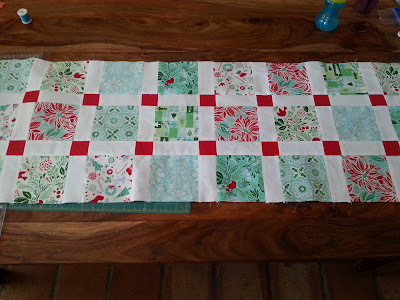 So far I have six done, and it always bugged me that I hadn't made a quilt for Christmas yet. This is a Kate Spain fabric for Moda called Jingle. I'll post a close up next time, but I love the cardinals and the aqua/red colors. 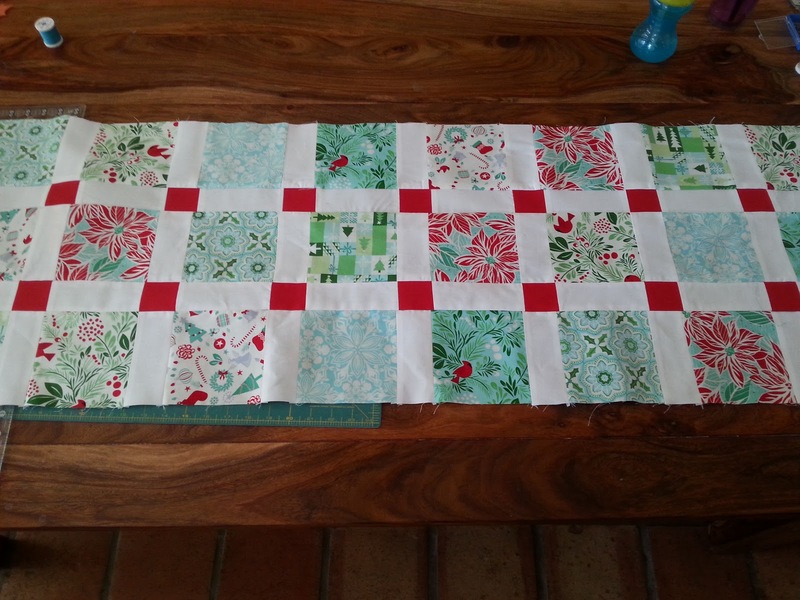 Fingers crossed this one will be done by December, I have about 5 more rows to sew together. But I was thinking today that what it means to me is probably far different than how it was originally meant. Not that we don't take time for rest and relaxation and spirituality on our weekends (which is how I imagine the quote was originally meant). But for me I always like to use my weekends to get ready for my week. Meaning most of my time is spent cleaning/shopping/doing laundry. We have so little time during the week to run out to stores to get stuff or do extra loads of laundry, and it really bothers me to come home to a messy house. So I enjoy the feeling of having everything done before we return to work and the kids start the school week, it helps me start my week content. On that note we did have a busy and fun weekend. Friday night we spent at the state fair. I had entered my Mirabilia mermaid. I didn't get a ribbon this year, but it was fun to see the pieces that did, and have my work shown. 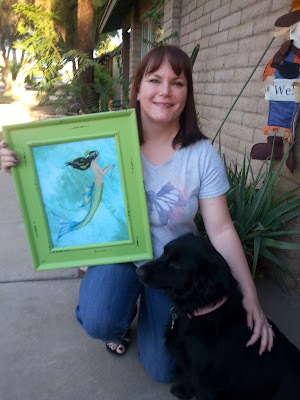 Here is me with my mermaid before dropping her off at the fair. The girls and I also entered the decorative mailbox category, and Zoe took third place for hers. She painted a sunset with dolphins silhouetted in front of it. 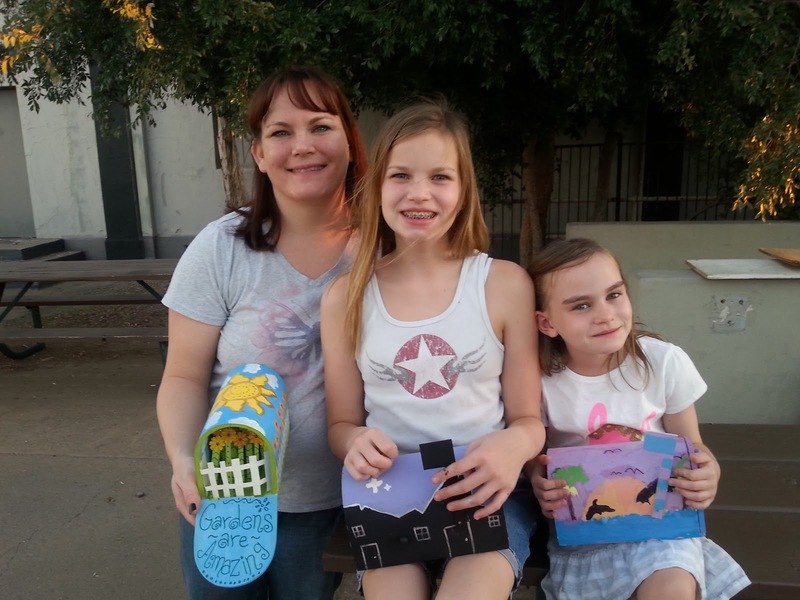 I was impressed with how much work and creativity she put into her project. I did a sunflower theme with mine and cut out little flowers to "plant" inside my mailbox. 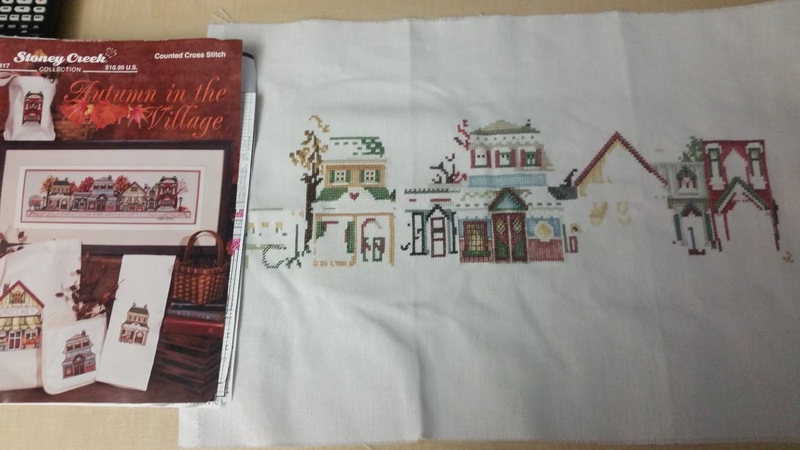 Here is another cross stitch at the fair (not stitched by me), a Rosewood Manor design I believe, that took third place. It's one of those pieces I didn't know I needed to do until I saw it in person. It was very cute. And my favorite quilt, this one took home a blue ribbon. I loved the Halloween theme, and their applique was beautifully done. And Calvin enjoyed all the animals at the fair. He especially liked the goats this year, I think because they let him pet them in their stalls. He was a little sad not to be able to ride any of the rides yet when big sisters got to go, but by next year he should be big enough to go on at least a few. He also loved the funnel cakes, though we couldn't get him to even try the cotton candy. I participated again in the HOE Halloween exchange. 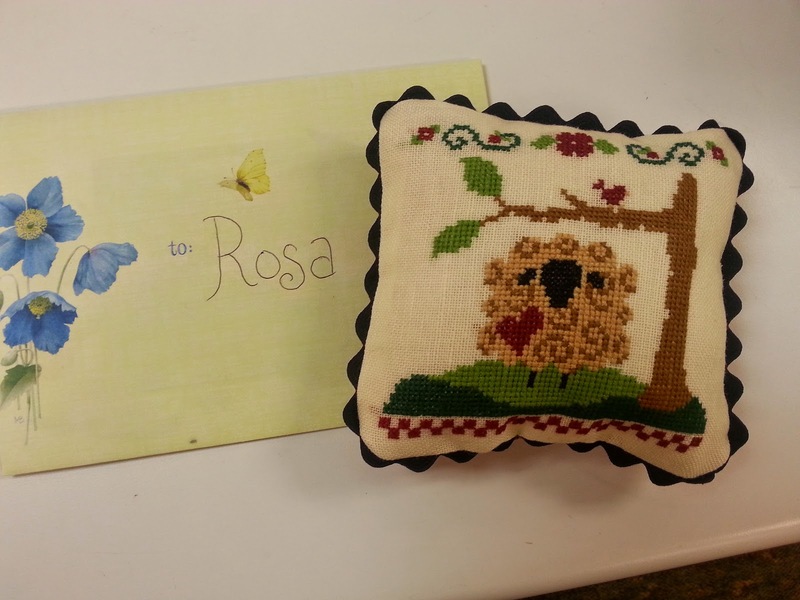 This is what I received from Amy of Cross Stitch and Cupcakes. 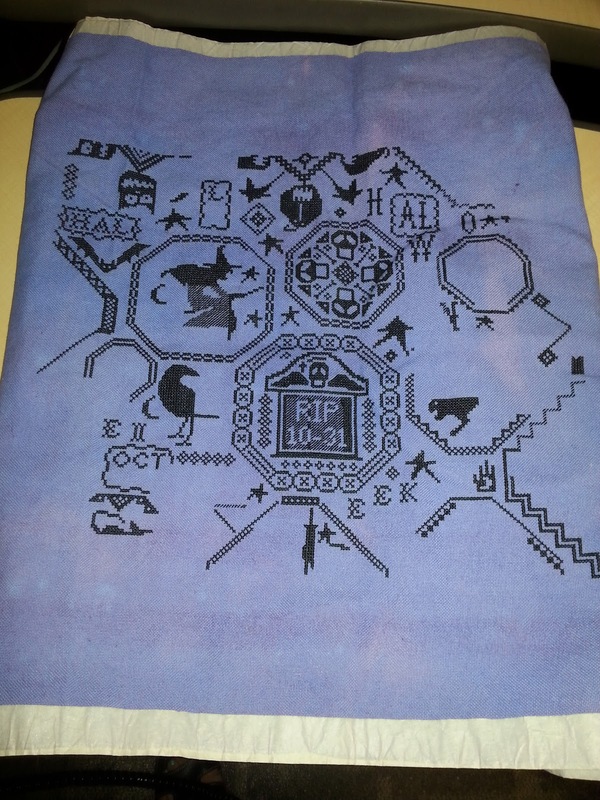 It is a Blue Ribbons Designs peice out of the JCS Halloween issue, and I love it! She made it into a treat bag and it came filled with candy YUM! She also made the two pillowcases you see underneath it in the photo, which are super cute Halloween colors. I am in awe of her sewing/finishing skills! 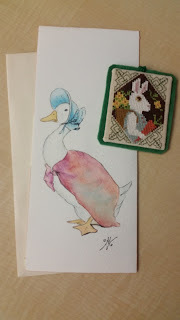 And this is the piece I sent out to Rachel of The Wandering Bunny. 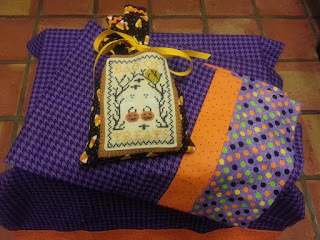 She posted a photo of it amongst her Halloween display on the HOE blog, and she has the cutest Halloween tree with all of these knitted/crocheted? ornaments. I need to get my act together and start digging out all of our Halloween decorations before October passes me by. 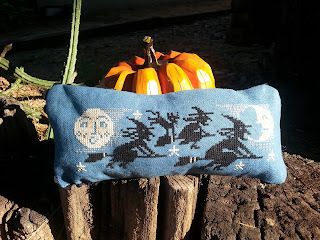 The ornament is a Prairie Schooler design, I stitched just the top of it actually cause I loved the trio of witches with that poor cat hanging off the broom. 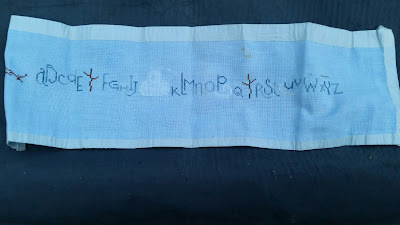 I also hand-dyed the linen, and still have a scrap of it which I will probably use to stitch this again for myself. Here is my stitching rotation for this week. 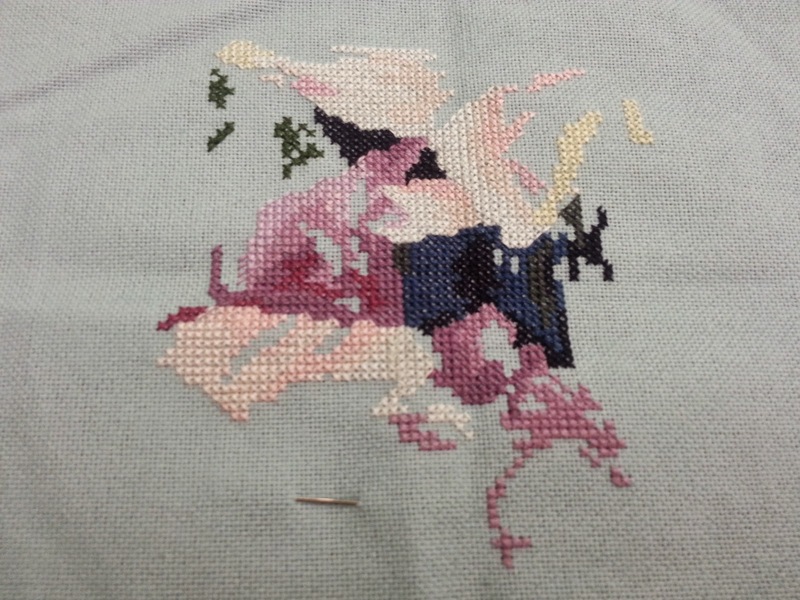 I am off two days from work this week, which actually means less stitching time for me instead of more. 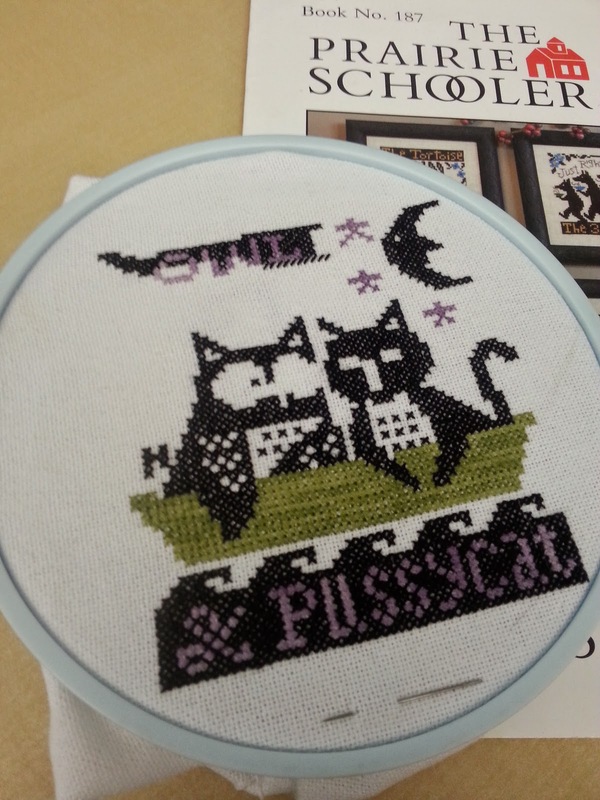 I am lucky enough to have a job where I can stitch when we aren't busy. Above is one of my favorites that I hope to have done and framed for this Halloween. Maybe not this rotation, but I really don't have to much left to do on it. A lot of back-stitching though. 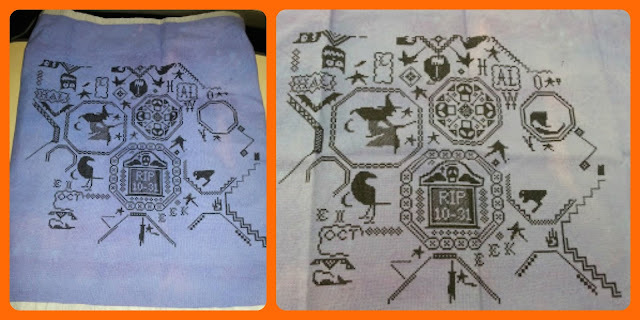 It is "Witches Hat" by Sharon Pope out of the JCS Halloween 2012 issue. This is "Moonlit Watch" by BBD. I love the blue linen with it, but it is tedious to stitch on. I use a hoop, and whenever I move the hoop it leaves open spots in the linen that I have to coax back into line. 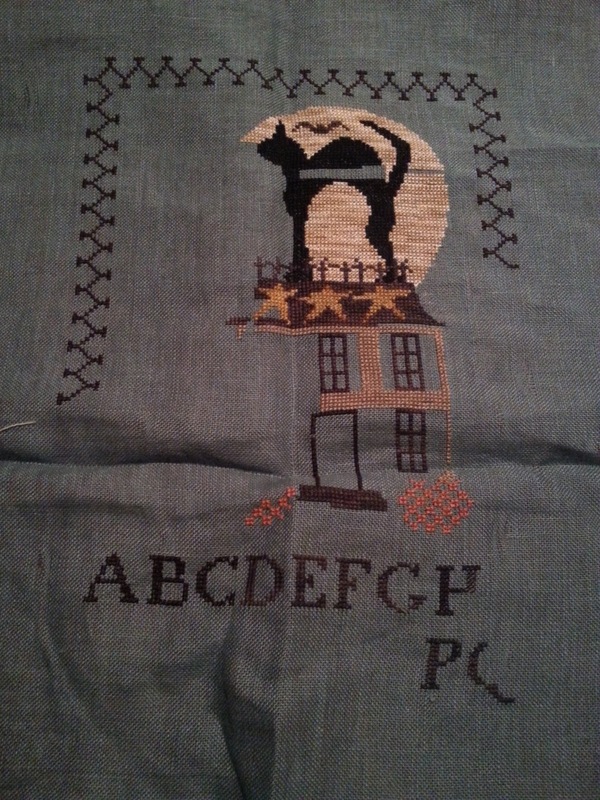 I need to find the thread I used to do the moon, I think that and the house will be my goal for this week. 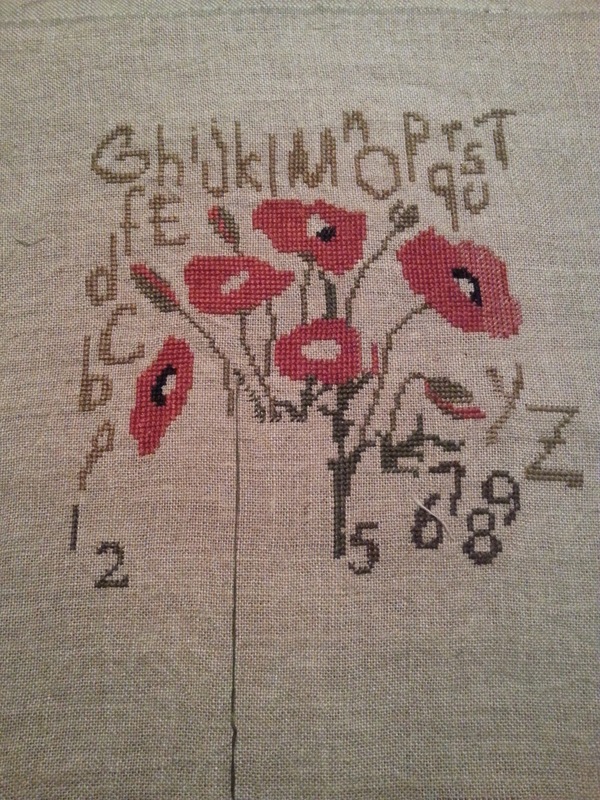 And this is "Country Poppies" by Cedar Hill designs. I was either brave or reckless with this kit. I bought it 1/4 started off of ebay. 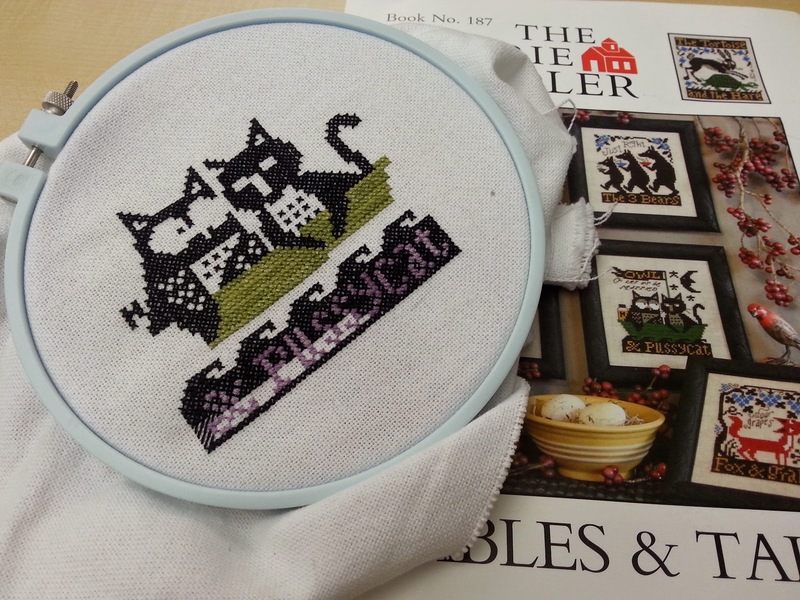 Luckily no major mistakes discovered as I have been stitching on it, and I do love the design. 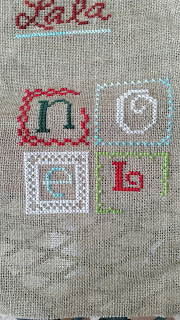 I am hoping to add this to my finished pile this week, Just need to finish some stems and 2 or 3 more letters/numbers. On the healthy side of things, I made it to the gym yesterday (I know I act like that's a big deal there are some people who apparently make it there every day!). I also walked the dog yesterday morning and today. At 5 am here it was 90 degrees outside and 28% humidity which is crazy high for us. You get used to the heat, but I hate hate hate feeling sticky and sweaty while I work out. I walked our border collie and by they time we had got home she had doubled in size just from her coat frizzing out. 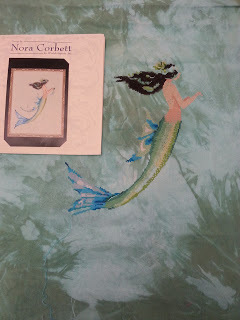 As promised here is my newest stitching project, "Mermaid Azure" by Nora Corbett. I hand-dyed the fabric she is stitched on, the darker parts are a little more green and the lighter parts a little more turquoise than what shows in the photo. I need to finish her hair and tail then on to the beading. She has been super quick to stitch for me if I would just stick with her. My stitching rotation this week has worked out well. 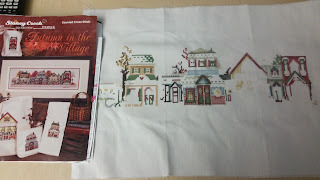 I pulled four projects from my WIP basket, and rotated my stitching time among them. Above is "Stained Glass Holly" by Ink Circles out of JCS magazine. I finished it, yay! 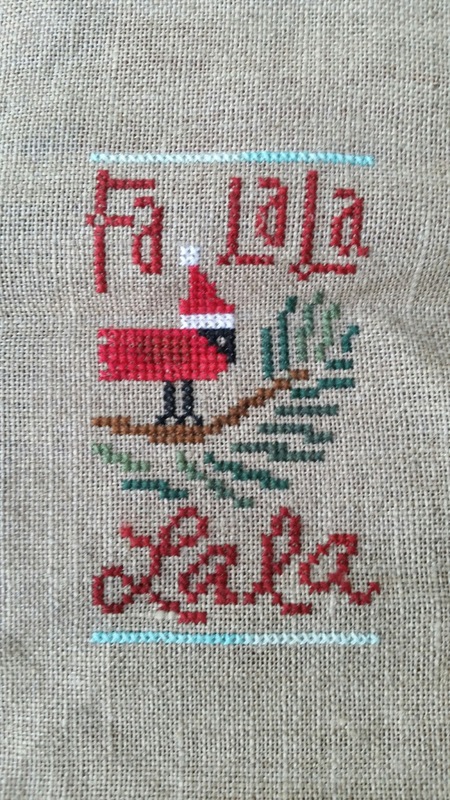 Now I just need to make it into an ornament to add to my Christmas stitchy tree. Maybe you can tell I have been playing with collage software, if you know of a free site for creating them let me know, I like to see my progress photos side by side. Playing with Jacks got a little love too. I worked on the pumpkin on the left, and all that white/grey of the Jack in the middle. I think I got a good bit done. "Thine is the Trick and the Treat"
So next week I plan to pick four new projects from my WIP basket to work on. I'll try and post "before" photos on Monday. I am thinking Blackbird Designs "Midnight Watch" ~ Lizzie Kate "Halloween Rules" ~ of course Nora Corbett "Mermaid Azure" (eager to get to her beading) and maybe either Bent Creek "Autumn Hilltops" or Prairie Schooler "Autumn Leaves"
On the health front I have done well this week. I lost two pounds, which was a relief cause all last week the scale wouldn't budge an ounce and I was soooo frustrated. I use Weight Watchers, and managed to track my points all 7 days. I also got in 4.5 hours of activity, and went to the gym 5 days this week. I am really liking our new gym, its a smaller one attached to a church, but they have great facilities and its never crowded plus they have childcare for our youngest when I need it. Here's hoping I can keep it up. I even have a little sticker chart by the door that I put a gold star on each time I go. My goal is 100 stars. Is that weird I need a reward chart to get myself to the gym? It's hard when your a busy mom! Been a long time but still here still stitching. I would say at anytime I have about 20 WIP's in my box. A pretty even mix of smaller and larger pieces. I had been working faithfully on a new start these last 2 weeks of a Mirabilia mermaid (I will show her off next post I promise), but decided to set her down to pick up some older WIP's out of my stitching basket. 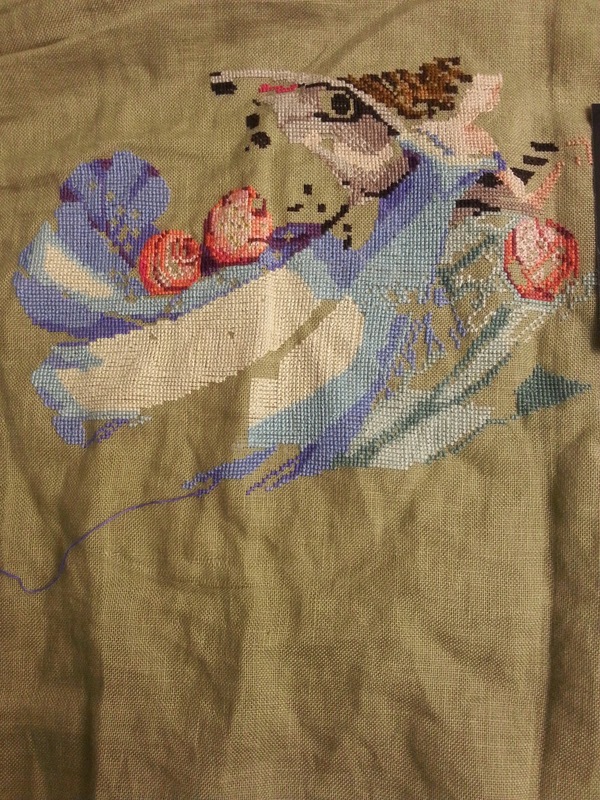 It's funny I was probably within one or two days of having the mermaid ready for beading. But her siren song was no longer calling to me. 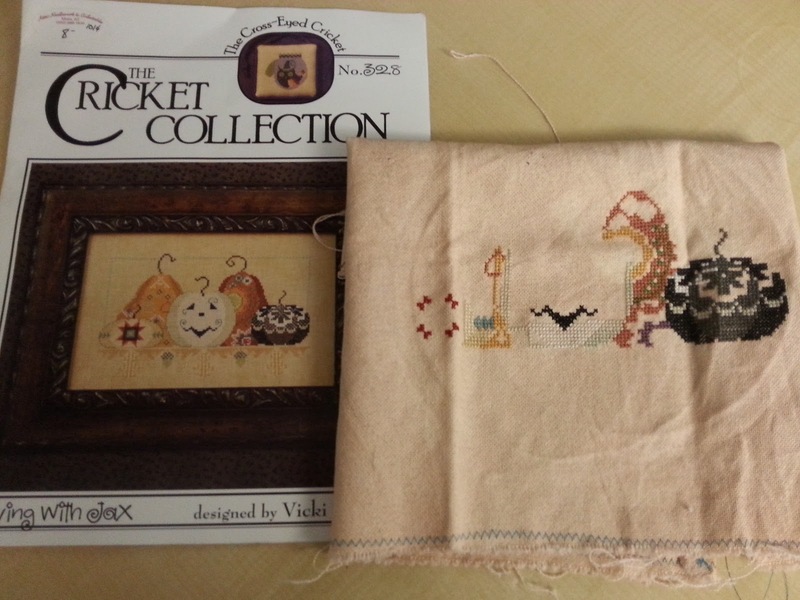 The top WIP is Prairie Moon's "Thine is the Trick and the Treat". I have finally made it to the 6th and final page of the pattern. Six pages is a BIG pattern for me. 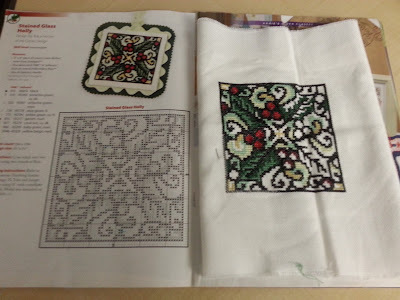 Next in rotation is an ornament out of the JCS Aug 14 issue, "Stained Glass Holly" of Ink Circles Designs. I think i am about 50% done with it, though looking at my photo of it I might have to call that an optimistic estimate. Next on the stitching pile my favorite season Autumn which is just around the corner. Cricket Collection "Playing with Jax" and Bent Creek "Thankful Quaker". Love the reds/tans/browns in each of these. And this is my view today from my treadmill. I recently joined a gym, and have been faithfully going with the hopes of losing (gosh this seems like a big number) 60 pounds before Christmas. We do Christmas family pictures each year, which I have a love/hate relationship with. Two years ago I was 9 months pregnant in our holiday pictures, and last year I was holding a baby and a lot of baby weight to go with him. This year will be different. So I have been doing Weight Watchers and reacquainting myself with exercise. Anyways today I couldn't get to the gym so I dusted off my treadmill at home. I had ordered some running videos online of basically trail runs set to nature sounds. They are pretty cool to watch, and you can pick which pace you want them to go at. Oddly enough they did not have "speed of snails" which is pretty much my pace right now. 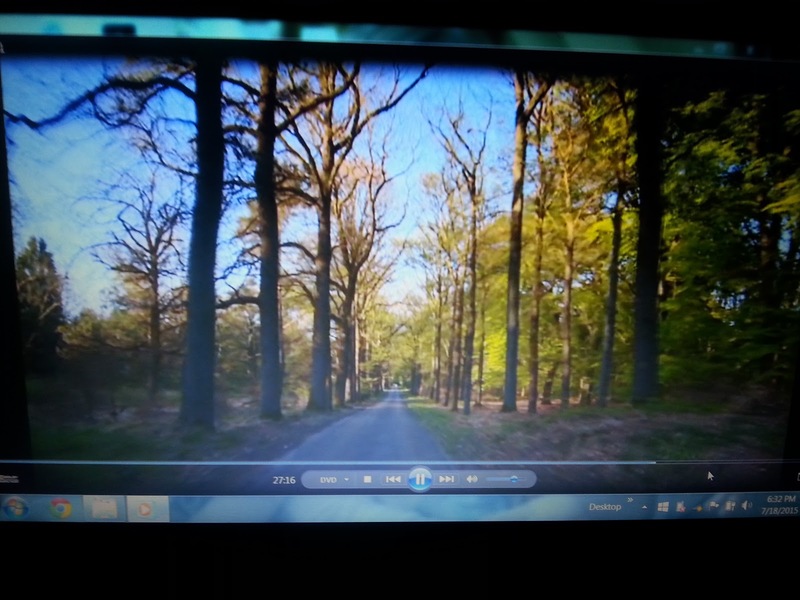 So this is how I watched videos. My treadmill faces a blank wall of boring, and we have talked of getting a small tv to put in front of it, but haven't yet. 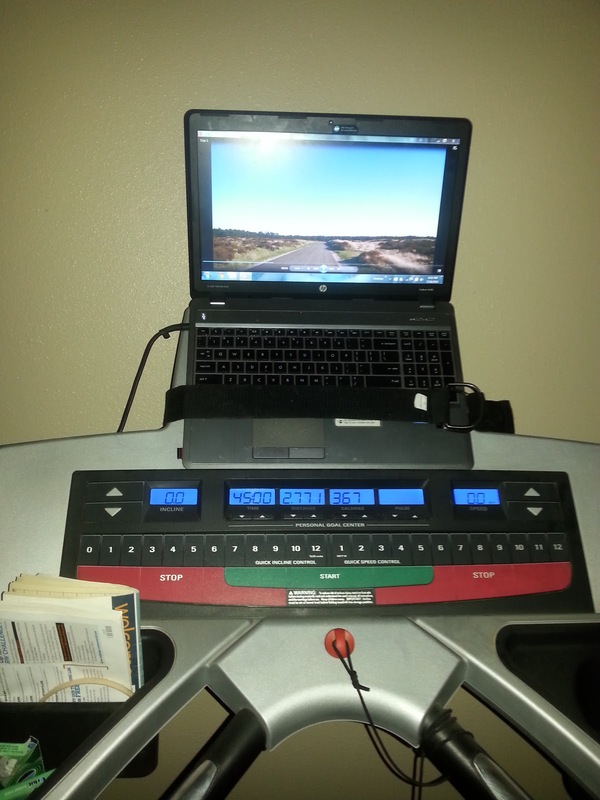 So instead I tied my laptop to the top of my treadmill using a belt so I could watch my running DVD's. 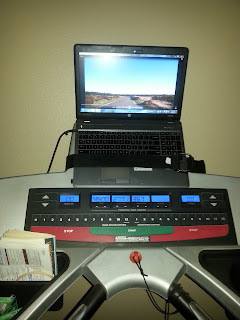 Luckily the laptop stayed put and didn't come crashing down in the middle of my run. This is the extent of our technology around my house. 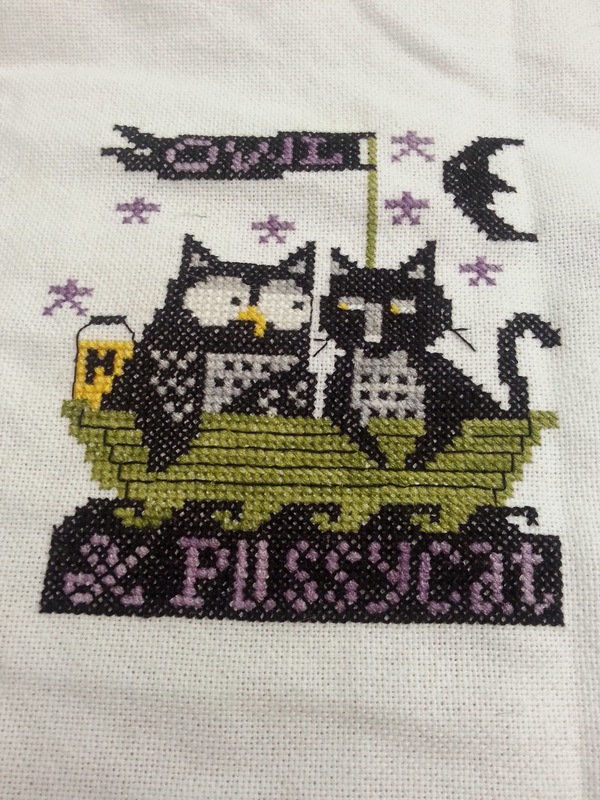 Progress on Prairie Schooler Owl and Pussycat. Just a few more rows of green under the boat to fill in those waves. Then their chests and eyes, they look a little weird not filled in. Hopefully by next week i'll have a finish to show off! 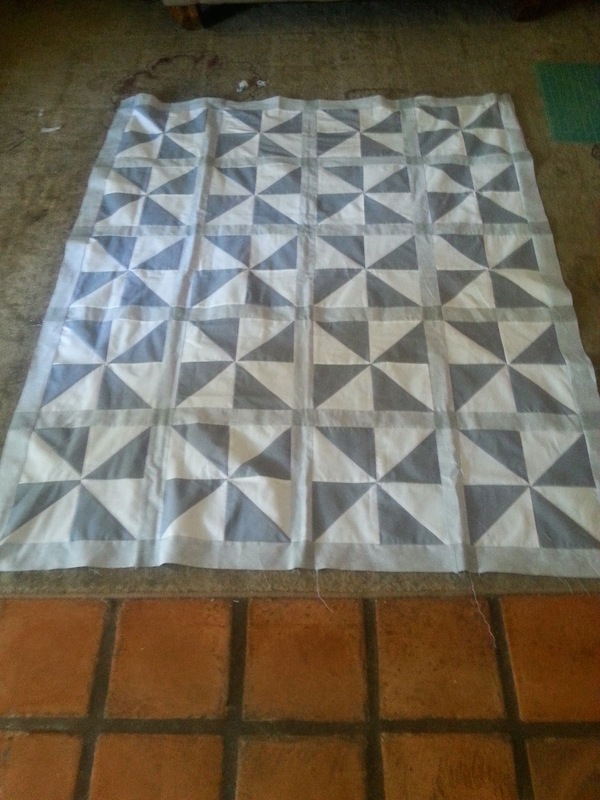 And here is my most recent quilt top finish. 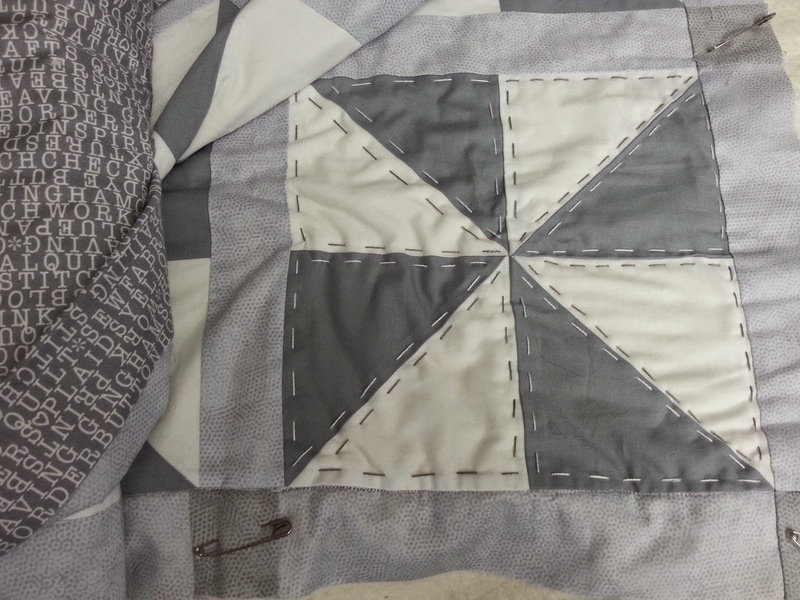 I have named this my "50 Shades of Gray" quilt. Don't worry, you don't have to point out that there is not actually fifty shades of grey in this quilt there is only four, I know. I just like the humor in naming a quilt after a dirty book (btw I have not read book/seen the movie yet they are both on my to do list). Here is the back of the quilt, and some of my stitching on the top. 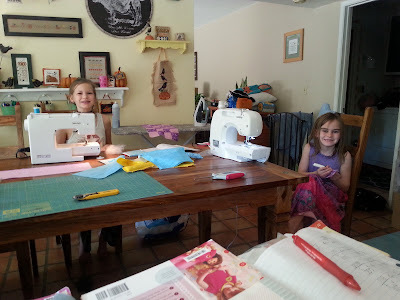 I am hand stitching the top of it because I don't want to pay to have it long-arm quilted since it is just for me, and it was too bulky to quilt on my own sewing machine. I do love the backing fabric, it has a bunch of sewing related words on it. I figured a quilt named after a book should have something literary on it. My latest exchange piece, finally arrived safely at it's destination. I had mailed it to Canada, and they sent it back because I didn't put my full name on the return address (I just used my first initial and last name). So I was super late in getting this to my exchange partner. 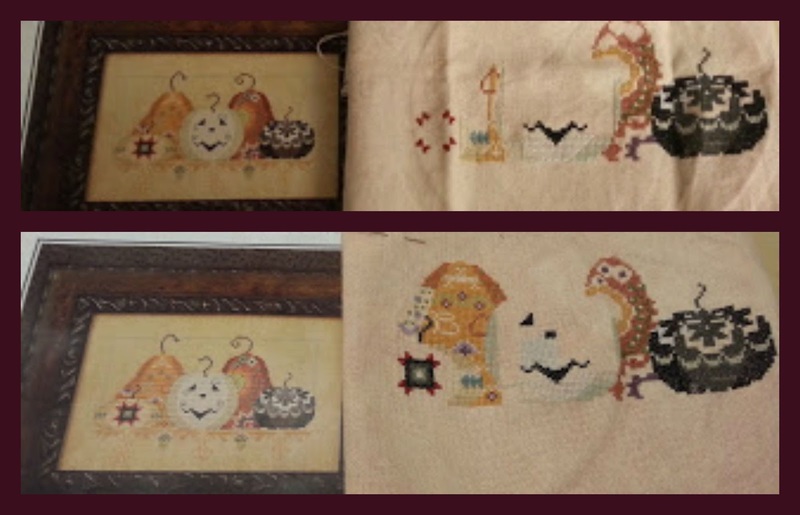 I had to laugh over this exchange, above is the sheep I stitched and below is the sheep that was stitched for me. Their twins, just with different color wool! My exchange partner must have had very good taste! I'll leave you again with more garden pics. These are blue hibiscus. 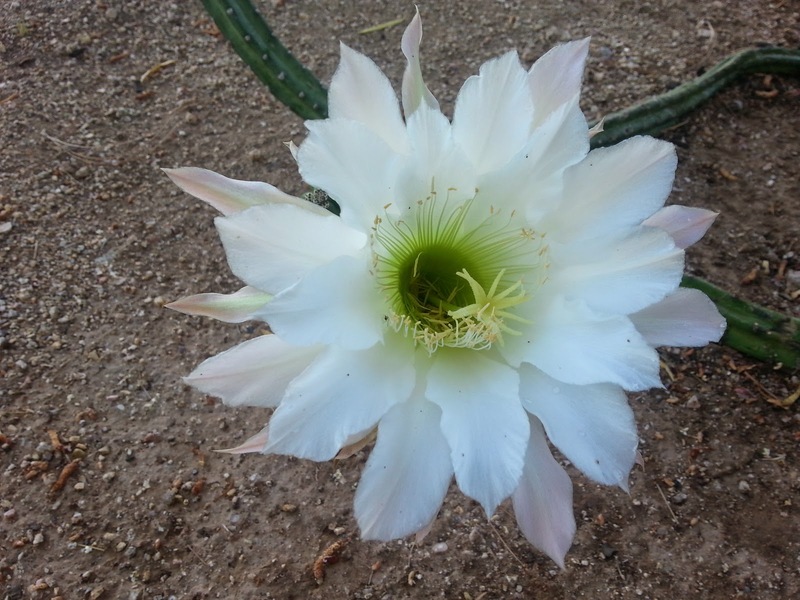 They only bloom in the spring, but are actually pretty hardy for our extreme desert heat. I have one plant that has lasted through four summers now. 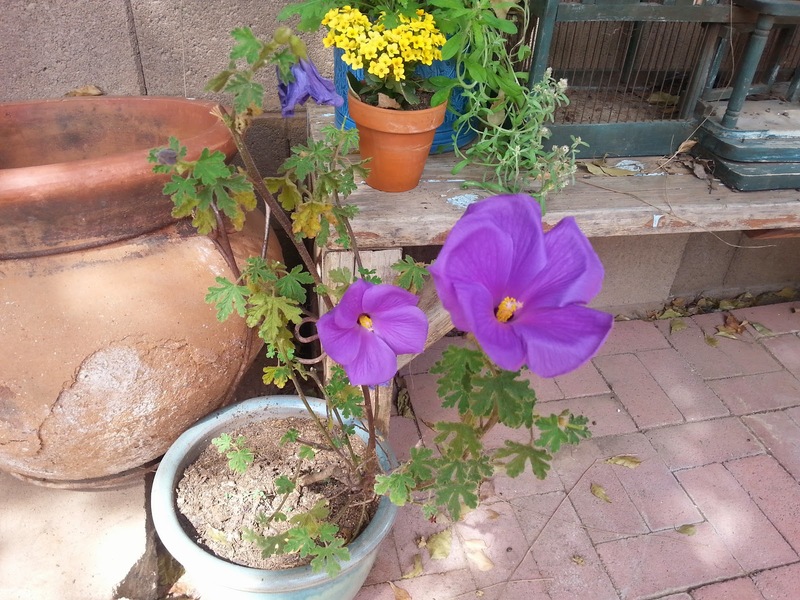 I love their pretty purple flowers. I forgot how much I enjoy sorting thread....said no one EVER! Especially not me. 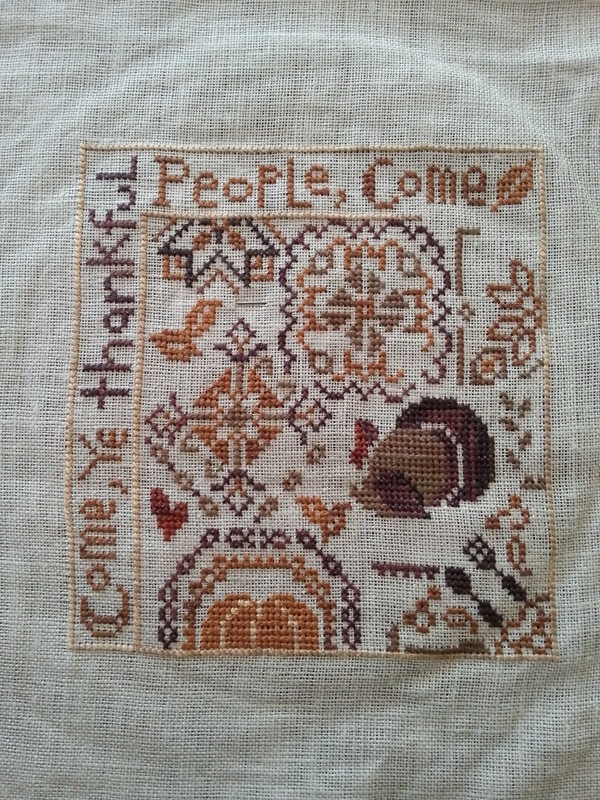 It's been years since I stitched a kit, but this one caught my eye. 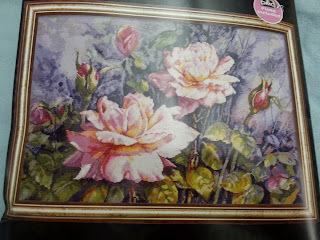 It is Bucilla's Heirloom Collection "Dana's Roses". 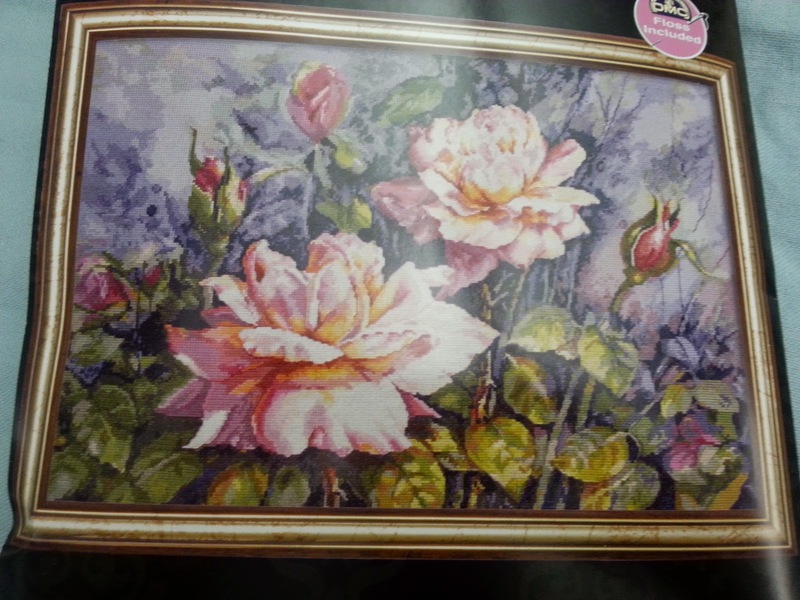 The roses look just like one of my favorite types of roses "Peace" roses, and the kit included 28 count evenweave instead of scratchy Aida. So I bought it, cause that's just what I need is another large project to start. The thread sorter the kit included even had a little color sample next to the holes to make it easier to sort the thread. Did not really help. 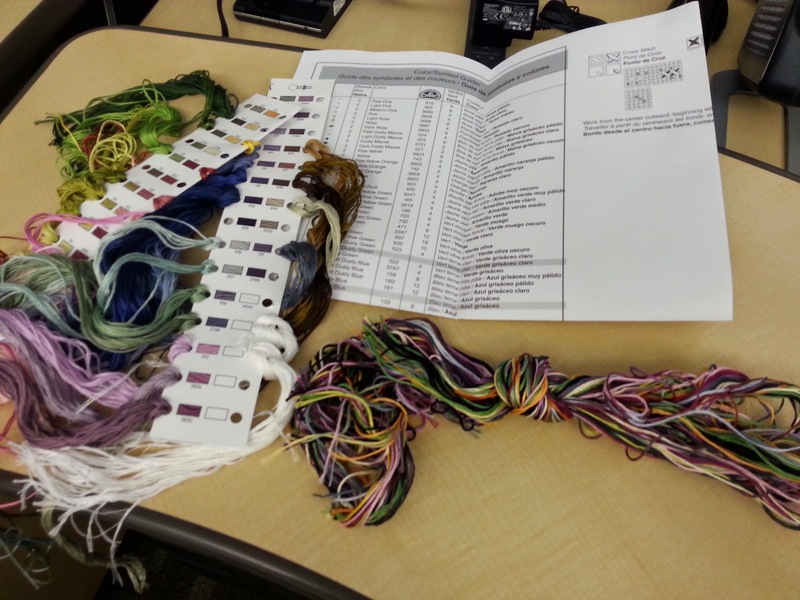 It still took me about an hour and several tangled messes to get all the thread sorted. Looking at how much thread is needed for this is a little intimidating. This is my fun small project for the month, Prairie Schooler's "Owl & the Pussycat". I changed the colors a bit, using WDW "Grasshopper" for the boat, and changing the words from gold to purple. I love the little children's poem. I had an aunt who lived abroad for many years as I was growing up, and I remember she gave me a book of English children's stories/poems. The Owl & Pussycat was in it, beautifully illustrated. The book also included another children's poem that still to this day frightens me, it was called "The Pobble who lost his Nose" if I remember right, and it was about an elf who swam across the English Channel and froze off his nose. Don't know why it scared me so as a child, but I do remember the elf/pobble being quite creepy looking in the story. 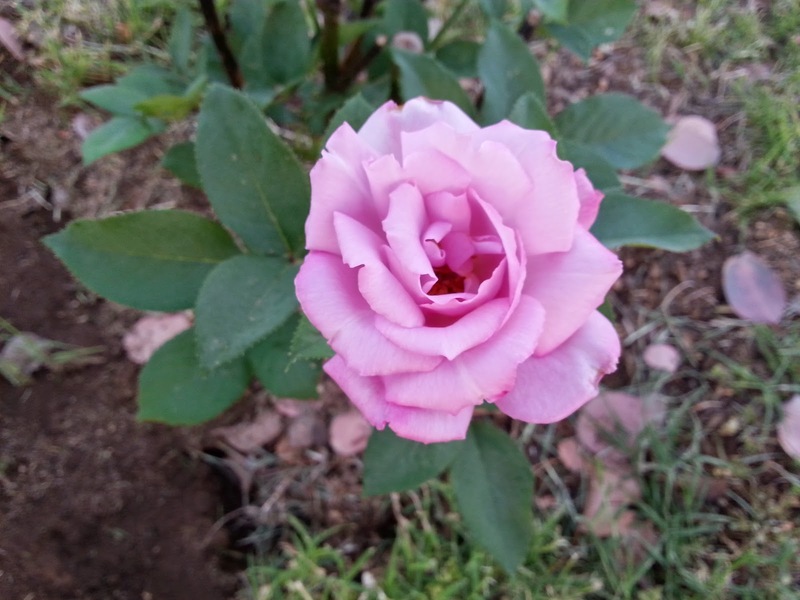 Here is one of my first rose blooms for the year. This variety is called "Moonlit Path" and they have a beautiful purple tinge to them. They line my driveway, and I love seeing them as I pull in from work. Hoping everyone had a pleasant Easter, and warm spring days ahead. Thanks for stopping by! Ever had one of those love/hate projects? That you were so far into that you just couldn't quit and start over on, but you knew it just wasn't what you wanted it to be? I give you my Shakespeare's Fairies (a Nora Corbett/Mirabilia design). 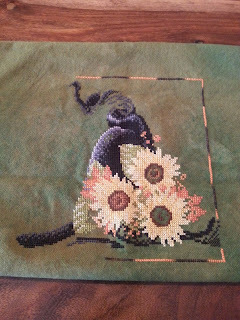 This was started about five years ago by me, and I think it is the linen that I stitched it on that I am just not loving. I picked the fabric for the color, but I would have been better off going with an evenweave fabric. My stitches look uneven on it, and I don't even really like the color of the fabric (wanted it to be more greenish). But I have already stitched most of one of the three fairies and it feels too late to start over now. I stitched a bit on it this week, and still LOVE LOVE LOVE the design, i'm just not in love with my version of it...sigh. I keep thinking maybe once I have finished it the love will come. 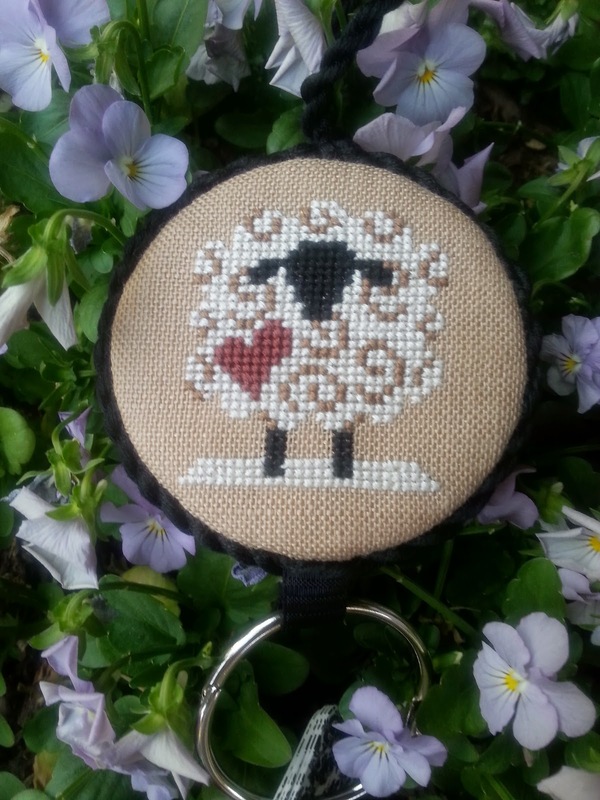 This little ewe is my cute Spring exchange off the HOE blog. It was stitched for me by Marie of creative threads blog It is a floss tag, and her finishing on it was just perfect. I am always nervous on my finishing, so I normally go the safe route of just a ornament or pillow. For the Christmas exchange I was a little braver and did a cute stocking. Anyways seeing finishes like this makes me green with envy. I hate to try something new for an exchange though, so I need to start being brave and practicing on the little stuff I make for me.